Getting out into the beautiful surroundings of Portland is a must do if you have the time. Be whisked out of the city and head down the Columbia Gorge National Scenic Byway to some of the most majestic views the Pacific Northwest has to offer on this half-day small-group tour. Travel through the dramatic Cascade Mountains to visit panoramic viewpoints, waterfalls, an historic (and haunted) Oregon hotel, and the famous Bonneville Dam. This tour has a maximum group size of 12. After pick you up from your location in downtown Portland, head out of the city to the Columbia Gorge National Scenic Byway. Be sure to bring your camera and be photo-shoot ready, since there will be a few pit stops along way. Take in the sights and the fresh air as well as an up close visit of one of our world famous waterfalls. Visit the Crown Point Vista House and Bonneville Dam too. While in Stevenson enjoy a tour of the Columbia Gorge Interpretive Center,and some smoked salmon at the Native American Fish Market. 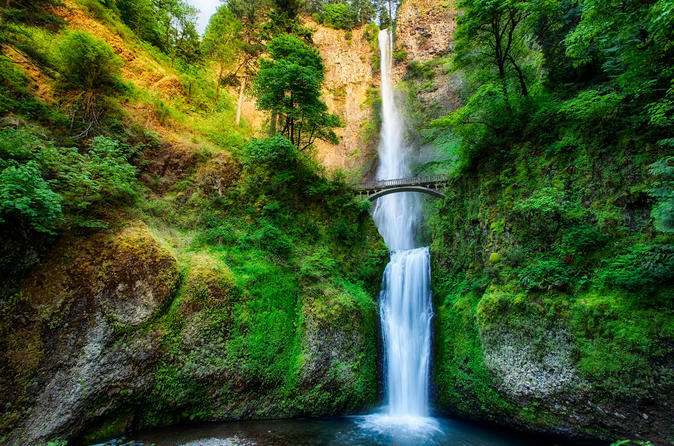 You will be impressed with the rich history and breathtaking beauty that only the Columbia Gorge can offer. Special Offer - Book and travel by April 30th and save 9% off our previously offered price! - Book Now!